Below you can view all the homes for sale in the Blue Mountain Estates subdivision located in Golden Colorado. Listings in Blue Mountain Estates are updated daily from data we receive from the Denver multiple listing service. To learn more about any of these homes or to receive custom notifications when a new property is listed for sale in Blue Mountain Estates, give us a call at 720-580-6937. 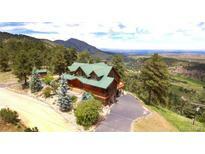 If you are looking for a Colorado Dream Home - THIS IS IT! ! MLS#7799310. Spirit Bear Realty. Amazing internet service through Mountain Broadband; terrific community water MLS#9082998. RE/MAX ALLIANCE. Privacy and Peace within 20 minutes of Boulder, Denver, and Golden. MLS#8393177. LIV Sotheby's International Realty. Too much more to list here! MLS#8812735. Wilson Group Real Estate. This home provides diverse possibilities for families, guests or corporate living and offers ample space to host even the largest parties and events. MLS#2811616. Optimum Home Team.